These two things probably do not go together but, when you are in a literature class and have a project in the works, they definitely do. As of late, I have found myself attracted to the writing styles of many American authors. Mind you, when I was a sophomore in high school I took an American literature class and could not have given two shits about the dead white male authors that were covered in class. Through this class I am now taking in order to complete my associates in English, I have learned that there are many authors other than just Hawthorne, Melville, and Twain. There were women and people of color who were writing at the same time, and who were held at the same esteem, but they seem to be looked over in the pages of history because they were not white men. One of my favorite, and most contradictory, authors is Ralph Waldo Emerson. If you have not read anything by him, I would highly suggest doing so; and while you are at it, read an excerpt from Olaudah Equiano. Be wary for his writing is not for the faint of heart. He tells true slave stories, some of which are hard to stomach. When I am not reading for my class, I have been knitting. I am very fortunate that I am able to be paid for what I love doing. 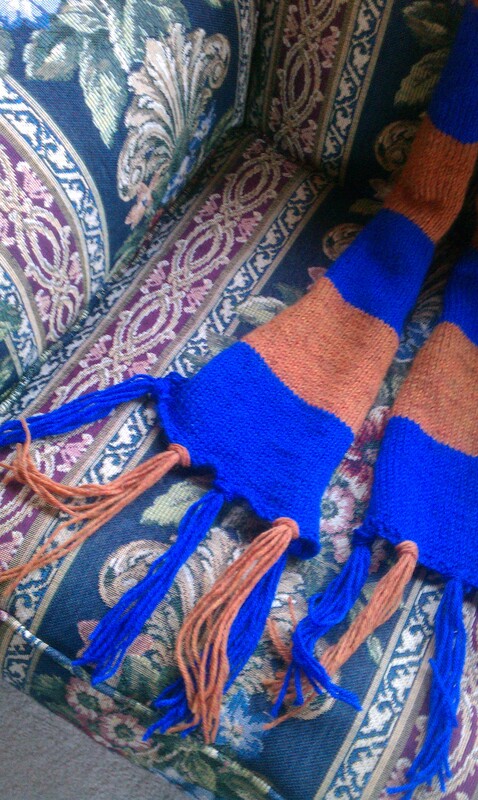 My current project is a Ravenclaw house scarf for a friend of mine. I am only showing a sneak peak of it as I do not want to show off the whole thing at this point.